NHL News : Reaves and Kane drop the gloves in the final minutes of Game 3! The bad blood between these two men has been evident for a very long time and it finally boiled over during Game 3 of the first round series between the Las Vegas Golden Knights and the San Jose Sharks in the Stanley Cup Playoffs. It was a rough night for the San Jose Sharks and it was evident in their play on Sunday night with several of their players letting their tempers get the best of them. 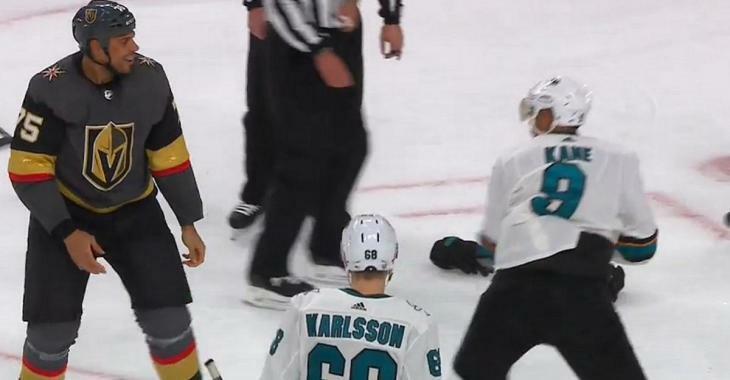 Heck even veteran Sharks forward Joe Thornton crossed the line on Sunday night when he took liberties with the Golden Knights' Thomas Nosek. The highlight of the night in that regard however came when San Jose Sharks forward Evander Kane decided to take on one of the biggest and baddest men in the league in the form of Golden Knights forward Ryan Reaves. I must say while this may look like a bad decision from Evander Kane, he absolutely held his own in this bout with Reaves and even appeared to do more damage to the face of Reaves than Reaves was able to return to him. This will certainly set the tone from Game 4 and I will be perfectly happy if we see more of this from these two.